It’s Saturday again, so that means a day full of football! Unfortunately, my dear Auburn Tigers are not having a very good season. And by “not having a very good season” I mean, “having a really really TERRIBLE, AWFUL, PATHETIC season.” Now don’t get me wrong, I will still cheer them on and support them til the last second of the last game. I will love Auburn whether we win every game or lose every game. As stated in the Auburn Creed, “I believe in Auburn and love it,” and that means even when we’re losing. So today, Auburn lost to Arkansas. And once again, it was heartbreaking. However, the best way to get over some football heartbreak is by eating some delicious food while hanging out with friends. My husband and I drove to Atlanta to spend the weekend with some friends who actually went to Auburn with me! So we shared our food and our heartbreak together. This dish is great for snacking and tailgating (other than your fingers get so messy). Everyone loves the combo of bacon, ranch, and cheese. And then put it on some warm, delicious sourdough bread and you’ve got yourself an amazing appetizer. This is really easy to throw together and it will definitely get devoured. The only thing, though, is that in the most inner part of the bread the cheese didn’t melt all the way. But that hardly affected the tastiness! Place slices of cheese in between cuts. Sprinkle bacon bits on bread, making sure to get in between cuts. Mix together butter and Ranch dressing mix. Pour over bread. Wrap the entire loaf in foil and place on a baking sheet. Bake for 15 minutes. Unwrap. Bake for an additional 10 minutes, or until cheese is melted. Oh, man, this looks soooooo good! How did you get your bread not to be crumbly when you sliced it? Oh it was definitely crumbly as I was slicing it, but it doesn’t fall apart or anything It probably wouldn’t work as well with a different type of bread that might be softer than sourdough. it looks great. wonder if it could be frozen for later use and then heated in the oven. I try to make heat and eat treats for my guys ahead of time, so all they have to do is bake it in thel oven. That’s a good idea! I’m not sure how well this would freeze, but if you give it a try, let us know! I’m anxious to try this recipe, it looks delicious! But I can see right now the biggest problem will be cutting the bread without totally mangling it! Ya know, that was my biggest concern too But as I cut, I learned that the loaf is actually quite resilient! It went much smoother than I thought it would! would like to print these recipes but I can’t find a “print” icon anywhere. Barbara, you should try a screenshot program. I use Google Chrome and there are several different programs that offer this. I usually take a picture of the whole page and then edit it to ingredients, instructions, picture and any hints. In Google Chrome there is a print icon right there in the area of the recipe. Click on it and you will see a print preview of only the recipe… perfect. no print icon, please include with recipies !!! I agree with Barbara, I have printed a couple but it prints everything including blogs. 5-6 pages on some. Regardless I am happy to have them. It’s very simple to copy and paste the recipe to a blank sheet so it can be printed out … without all the other stuff. That’s what I thought Carrie! I didn’t know it would be an issue to not have a print button because everyone can copy and paste But oh well If so many people are asking for it, then I will try to figure out how to have a print icon! I just wanted to comment in response to all of you about printing capabilities There is now a “printer friendly version” link available just below the title of the recipe Ask and you shall receive! Great site! I really love how it is simple to read. new article has been made. I have subscribed to your feed which must do! Have a great day and please excuse my poor english! Thank you! On the right side of the page, you’ll see 3 different ways you can be updated of new recipes: “Like me on facebook,” “follow me on pinterest,” and “Follow this Blog” which sends you email notifications You can choose whichever one (or two, or three) you like to use and stay up to date that way! Thanks for following! Looks yummy. Will have to give it a try. Hope you like it! Let me know what you think! 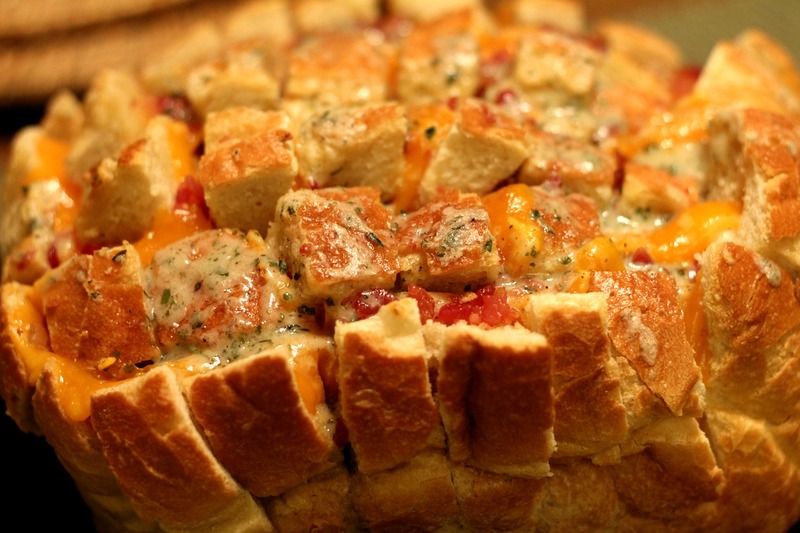 I’ve made thus several times and it is exactly what they say…CRACK BREAD! it is will addictive. haha I know I just can’t stop eating it! Hi Angela! Yes you can use shredded cheese. You’ll probably want to stuff it down in the cracks a little so it doesn’t fall out. And yes, the ranch mix is the one that comes in the packet, but you won’t need to use all of it. I am going to make this tonoght. Does it warm up OK in microwave? I’ve never done it in the microwave, but I think it would warm up fine! Let us know how it turns out! 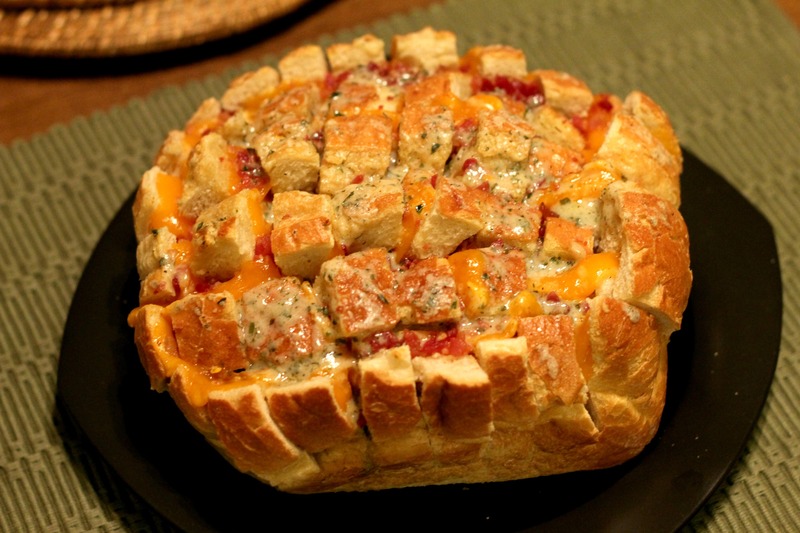 I want to bring this for a potluck, but there’s no oven there to bake the bread and cheese in. Would it be OK if I baked it, brought it to the potluck, and then microwaved it? Not too sure if that would be good for the texture of the bread…. I think that would work fine. It probably won’t taste quite as good as straight from the oven, but definitely would still be a hit at a party. A toaster oven would probably be better if that’s available. Don’t use a serrated knife to cut the bread. Use a VERY sharp chefs knife and it will cut fine. I have found it is best to use day old bread and refrigerate it for a little while before cutting. Haven’t mangled it yet. Trying something new with this loaf. I have prepared it all today (except for drizzling the butter), and tomorrow, I will drizzle the butter and cook it off in a crock pot, as I will not have an oven. Will let you know how it turns out! Please let us know how it turns out Kathy! I never thought of making this in the crockpot! What is even more interesting, is that it will have traveled 1100 miles in a suitcase thermal bag (in checked luggage) before hitting the crock pot! What?! That’s crazy! I applaud your dedication to making this dish no matter the obstacles! Brother in law made this for Thanksgiving and I had to try it out myself. Used Kraft shredded cheddar (mild, sharp & Vermont white cheddar), just had to stuff it down into the cuts. Probably used too much of the Ranch packet but it wasn’t overwhelming. Took it out 2 minutes early because…patience takes too much time. The wife ate half the loaf after saying she didn’t want any before I made it. Good stuff! Glad your family enjoyed it! Sounds like your wife and I have that in common, haha!